NASCAR Fines Denny Hamlin For Criticizing Its New Car Model; Hamlin Simply Says, "I'm Not Going To Pay"
Aside from the terrifying Nationwide wreck and the hype around Danica Patrick's pole, the Daytona 500 was kind of boring. Lots of single file racing, few passes, little excitement. The afternoon saw 28 lead changes among 14 drives, down from 74 and 22 in the same race just two years ago. 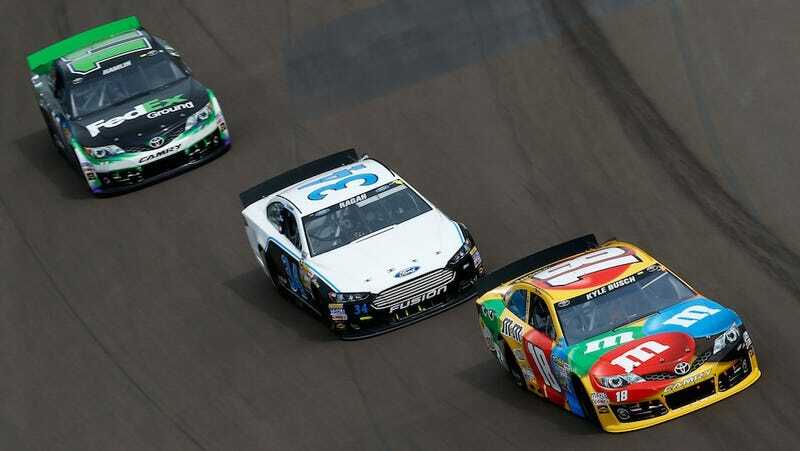 Worryingly, it was also the big-stage debut for NASCAR's Generation-6 car, which replaced the much-criticized Car of Tomorrow after six years. But drivers were willing to give it the benefit of the doubt—Daytona is a restrictor plate track, and this past Sunday in Phoenix, the hope was that the Gen-6 would finally be able to show its stuff. "This is more like what the Generation 5 was at the beginning," he said. "The teams hadn't figured out how to get the aero balance right. Right now, you just run single-file and you cannot get around the guy in front of you. You would have placed me in 20th place with 30 (laps) to go, I would have stayed there - I wouldn't have moved up. It's just one of those things where track position is everything." Well, NASCAR fined Hamlin $25,000 yesterday, for "comments... that denigrate the racing product." Hamlin's response? He's just not going to pay. "Ultimately, I'm not OK with it," Hamlin said during the Gen-6 test at Las Vegas Motor Speedway. "This is the most upset and angry I've been in a really, really long time about anything ... anything that relates to NASCAR. "The truth is what the truth is. I don't believe in this. I'm never going to believe in it. As far as I'm concerned, I'm not going to pay the fine. If they suspend me, they suspend me. I don't care at this point." Hamlin later took to Twitter to try and clarify his initial comments critical of the Gen-6, but stood by his refusal to pay the fine, and announced he would appeal. He wrote that this goes "much deeper," a likely reference to a 2010 incident in which Hamlin was secretly fined $50,000 for Twitter remarks criticizing NASCAR's caution rules. He's largely toed the company line since then, and appears furious that one critical remark, one that wasn't even particularly bad, has him in trouble again. "It's good," he said. "The car is good. Everything is very, very good." The news reporters in attendance at Las Vegas Motor Speedway burst into laughter. After Hamlin's fine was announced, no one expected drivers to offer many honest opinions.